The Sepasoft™ Business Connector Suite builds upon decades of industry best practices to enable seamless integration between your enterprise systems and your Ignition®-powered manufacturing floor. 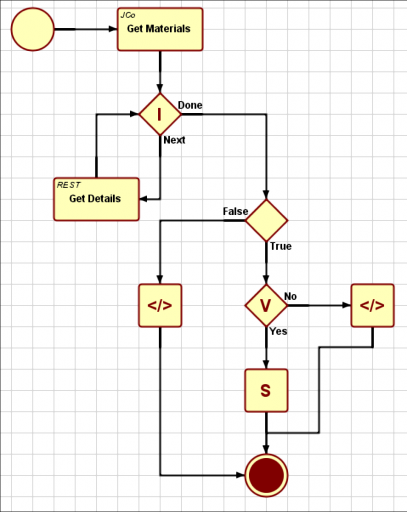 Drag and drop action blocks to construct business logic, which may include control flow concepts like loops, conditionals, and exception handling. Step through sequences while monitoring intermediate results to ease development and troubleshooting. Leverage the power and flexibility of Business Process Execution Language (BPEL) to execute complex workflows. Sequences can include transactions to multiple business systems by leveraging companion modules such as Web Services and the Interface for SAP Modules. Trigger sequences based on a schedule, tag change event, web service call, or script function. Enjoy a lower Total Cost of Ownership (TCO) by leveraging familiar Ignition® idioms like drag and drop, tag binding, and scripting. The Business Connector is integrated with the Ignition® ecosystem and builds on existing skillsets, significantly reducing cost and learning curves to maintain your system. Leave the expensive middleware at home! The Business Connector Module builds on the Ignition® “unlimited” mantra—unlimited connections and sequences—at a price that’s an order of magnitude less than traditional middleware products. Do more for less with Business Connector. Leverage the Web Services Module or specialty connectors such as the Interface for SAP Module to communicate with multiple business systems, all within the same sequence—and without additional (and expensive) middleware. An intuitive mapping tool lets you connect and transform data received from external business systems into production data, such as schedules and material definitions, for use by other modules, including OEE, Recipe, and Track & Trace. Built on the MES Enterprise 2.0 backbone and the Ignition® network functionality, Business Connector intelligently synchronizes production data across your enterprise—only to where it’s needed. Rather than reinventing the wheel, the Business Connector Suite leverages industry standards like B2MML, an XML-based implementation of the ISA-95 object models, to ease integration with external business systems. Like Ignition®, the Business Connector Suite works across Windows and Linux on both 32- and 64-bit architectures. The intuitive visual interface of Business Connector accelerates configuration, dramatically reducing labor costs to implement business communications. The lower learning curve increases scalability, simplifying maintenance, making it ideal for high-availability, low-downtime environments. The concurrent execution and exception capability supports reliable communications and high-data throughput. Best practices and industry standards for communications are baked into our product, increasing reliability and trust while decreasing risk. Business Connector installs as a module on Ignition®, the powerful, award-winning, HMI, SCADA, and industrial software platform from Inductive Automation. This module works seamlessly with the MES Suite, built to help your enterprise align with ISA-95 model standards.